What are the requirements for signing a will? The will must be witnessed by two persons who are not beneficiaries. Will might be challenged if these formalities is not been followed. 1. What assets will you put in the will? Significant and specific assets to give away to the intended person. 2. Who will you be giving your assets to? To give away according to your wish. 3. Who will administer your will? He or she must have impeccable integrity, good common sense and a person that is aware of your desire for them to serve as executor (and are agreeable to that role). 4. Who will care for your children? If you have children under the age of 18 (minor), you’ll want to think about who will take care of your children, should you die before your kids are adults. Your chosen guardian has sufficient assets to raise your children? 5. Who will care for your children’s assets? A trustee will care for the assets that you leave to your children if they are still minors. 6. Who will witness the execution of your will? Other then the beneficiaries or the interested parties. What happen if you don’t have a Will? 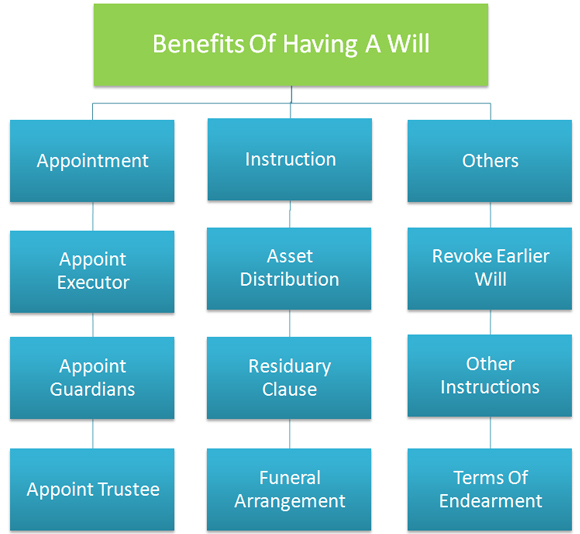 What happen if someone dies without a Will? The estate of the deceased is frozen. The immediate family members need to apply for Letter of Administration to unlock the deceased estate before transferring to his/her possession. 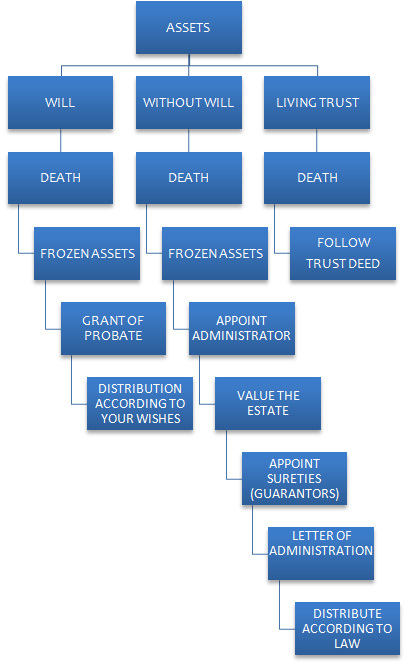 Once a person died intestate (without a will) the estate will be distributed accordingly to the strict Malaysian Law (the Distribution Act 1958) which may not be as you would wish and this could cause considerable financial hardship to your family and sometimes the loss of money to your dependents who need it most and at the worst possible time. There may be difficulties in deciding on the appointment of the administrators as beneficiaries may not agree to the choice. This may result in a long legal tussle. An Administration Bond must be provided by two sureties. No protection for partners, stepchildren and aged relatives. If you have no spouse or children, your property passes to your grandchildren, your parents or your brothers and sisters. If you have no relatives, your estate passes to the State of Government. If you have a child under 18, the court may choose someone to take care of that child and the property passing to them. Without a Will, the distribution of an intestate estate is governed by the Distribution (Amendment) Act 1997 which applies to West Malaysia and Sarawak and is effective from 31st August 1997. The Act does not apply to Muslims and the natives of Sarawak. The distribution of an intestate estate in Sabah is governed by the Intestate Succession Ordinance 1960 which does not apply to Muslim and natives of Sabah. PLEASE NOTE THE FOREGOING IS GENERAL INFORMATION. WE SHOULD DISCUSS YOUR SPECIFIC SITUATION IN DETAIL TO PREPARE YOUR WILL AND OTHER ESTATE PLANNING DOCUMENTS. Your choice for personal representative (executor) of your estate who is a person who takes charge and makes certain decisions about your property after your death. You may also excuse a bond for the personal representative to save that expense. Your wishes are clear and definite, thereby reducing the possibility of confusion and quarrel among your heirs. If I have a will, do I also need a Living Trust? A will is an essential part of a basic estate plan and should accomplish a variety of objectives; primary among them is specifying who will receive your property and designating a legal guardian for your minor children, if you have any. A Will cannot avoid probate of your estate. A probate is a public, court-supervised collection of your assets, payment of taxes and other creditors, and then a distribution of the remaining amounts to your beneficiaries which are time-consuming and expensive process. To avoid this, we recommend a living trust in addition to the basic will. Property that has been transferred to the living trust prior to death is not subject to the probate process and passes smoothly and efficiently to the named survivors. Thus, one of the living trust’s objectives is to transfer property, minimizing final expenses and at a speedier rate to assist your love ones when it means the most. Can there be more than one? Testator's latest Will automatically revokes earlier Wills Settlor can create more than one Trust. Can it be revoked by the person who made it? Testator can revoke Will at any time Settlor can revoke trust if there is a revocation clause in the trust deed. Is it effective in giving away future property? Testator can include property which he anticipates receiving in the future. No. Settlor cannot purport to transfer property not yet owned.